Does Exercising Cure Parkinson's Disease? Caused by a lack of dopamine levels in the brain, Parkinson’s disease is a neurological disorder that gradually makes it more challenging to control movements in the body. Parkinson’s disease still isn’t fully understood, so there are a variety of theories about what can be used to cure it. A fairly popular concept is the idea that exercise is enough to fix Parkinson’s disease, but the science behind this speculation still isn’t definitive. Here’s what you need to know about Parkinson’s disease and exercise. The reason some people think exercise may cure Parkinson’s disease is due to dopamine. One of the underlying causes of Parkinson’s disease is the brain’s inability to produce dopamine, a hormone linked to reward-motivated behavior that stimulates nerves throughout the body. This hormone is produced in higher amounts whenever a person exercises. Though the brains of people with Parkinson’s produce less dopamine on average, exercise does boost dopamine levels to more normal values. If your loved one needs help exercising safely, consider enlisting the help of a professional caregiver. When considering in-home care, Montgomery, AL, families should make sure their senior loved ones have the resources they need to maintain their independence and remain healthy. Trusted in-home care professionals can assist seniors with daily tasks like cooking, bathing, and exercise, and they can also encourage them to focus on healthier lifestyle habits. A 2009 study called the Parkinson’s Outcomes Project examined more than 12,000 participants and found that exercise can slow the progression of Parkinson’s. Exercising enhanced quality of life and staved off the development of tremors, immobility, and other issues. People noticed their tremors got worse while they were exercising, since fatigue can worsen immediate Parkinson’s symptoms, but in the long run, they didn’t experience symptoms as intensely as the people who didn’t regularly exercise. The research discovered that seniors need at least 2.5 hours of exercise per week to get the protective benefits of exercise. Depending on the progression of the disease, some aging adults with Parkinson’s may need extra help with everyday activities, and the amount of assistance required can vary, from occasional to around the clock. If your senior loved one needs hourly or live-in care, Montgomery Home Care Assistance can help. Our caregivers can assist with exercise and mobility, prepare nutritious meals, provide timely medication reminders, and help with a wide array of other important daily tasks. It’s interesting to note that not all forms of exercise are equal when it comes to managing Parkinson’s disease. Research published in JAMA Neurology in 2017 measured how seniors with Parkinson’s reacted to various forms of exercise. It turns out that more vigorous forms of exercise, like running on a treadmill at a steep incline, were more useful. People who did mild or moderate exercise didn’t experience progression of the disease as fast as the group who avoided exercise, but their increase in symptoms was still more rapid than the group who exercised at an intense rate. In addition to intensity, another helpful form of exercise focused on balance and coordination. 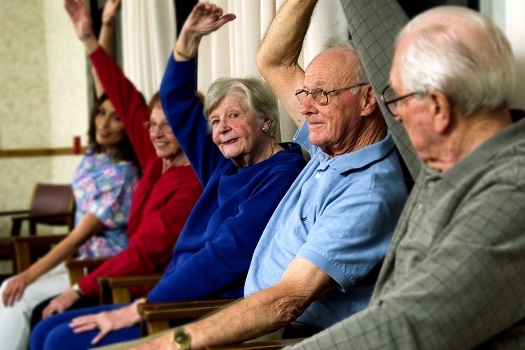 Activities like yoga and tai chi were particularly useful because they helped seniors gain the skills needed to manage issues caused by Parkinson’s. It would be nice if exercising were so effective that it entirely cured Parkinson’s disease. However, healthcare experts caution that exercise is just one of the many methods for managing the condition. Though it can be helpful on its own, exercise cannot provide all the benefits gained from other forms of Parkinson’s treatment. Some aging adults with Parkinson’s may need help getting the exercise they need to stay strong. In Montgomery, home care service agencies can be a great boon to seniors. With the help of the caregivers at Home Care Assistance, your aging loved one can lead a happier and healthier life. We offer a revolutionary program called the Balanced Care Method, which encourages seniors to eat nutritious foods, exercise and socialize regularly, and focus on other lifestyle factors that increase life expectancy. Trust Home Care Assistance to provide high-quality compassionate, professional care for your loved one. If your loved one needs help with the challenges of aging, call one of our compassionate Care Managers today at (334) 593-3988.